Serbia has connected West with East for centuries. It is located in the centre of the Balkan Peninsula, in southeastern Europe. The northern portion belongs to central Europe, but in terms of geography and climate it is also partly a Mediterranean country. Serbia is landlocked but as a Danube country it is connected to distant seas and oceans. Serbia is a crossroads of Europe and a geopolitically important territory. The international roads and railway lines, which run through the country, form the shortest link between Western Europe and the Middle East. From the agricultural regions of the Pannonian Plain in the north, across the fertile river valleys and orchard-covered hills of Šumadija, the landscape of Serbia continues southward, gradually giving way to mountains rich in canyons, gorges and caves, as well as well-preserved forests. The cultural and historical heritage of Serbia begins with prehistoric archaeological sites and its legacy from classical antiquity. 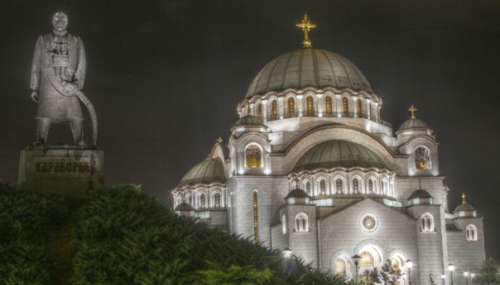 There are the many medieval Serbian churches and monasteries, some of which are included on the UNESCO World Heritage Site list. Serbia is a modern, democratic European country, on the path to membership of the European Union. Serbia debuted in Miss World 2006. This year, the nation will be represented by Bojana Lečić, Miss World Serbia 2012. The Times of Beauty proudly presents Bojana Lečić, Miss World Serbia 2012, in an exclusive interview for our interview series, Meet the Misses. I am Bojana Lečić, 22 years old. I came from Serbia, from Nova Varos. I'm interested in information technologies and I'm studying that. The greatest enjoyment for me is in nature, beside some river, and cause of that, I really love my small town on the mountain. I'm giving all my love to my three sisters. As I said, my occupational field is information technologies, and I'll work in some computer company, or I'll be owner of one. But now, I also like to work as a model, but that's just while I'm studying. I am most proud of my parents because I was educated in the right way, to always be myself and to primarily be a good person. Thanks to them and their upbringing, because of that I am totally the same person like before I elected for Miss Serbia, I keep my old friends and acquire new ones, and education is always on the first place and every day I try to do only good things because that's really happiness. Definitely, that is reading books. It happened to me that I read all day and all night when a book is very interesting. Here in Serbia, in many interviews some of my friends have given statements and they usually say that I am responsible, conscientious and persistent person. They know they I do not like quarrels and always trying to find a solution for everything. There is something called the art of living. I live with respect to this rule. At any time doing what you want and to live out each day in the best manner. It seems easy, but it isn't. I was lucky as God has given me beauty, but this beauty will have sense only if I complete it with other human values. I'm doing that every day and enjoy in life. I am really happy that I had the opportunity to participate in a humanitarian action. It is a charity concert held to raise funds for the recovery of a handicapped young people. As Miss Serbia, I worked promoting of this event and inviting people to be humane and with small gestures do great thing. Worse thing is never trying, of course. It's just important to have goals. If you really want something, you will do everything to achieve that. So, I always try to do everything what I want. And in the most cases, I have success because I have really strong will and persistence. I will teach them to take advantage of every single day. One of my mottos is: As long as I can say this is the best period of my life, I know that I do the right things, to appreciate life. Not to challenge destiny and believe in God. Beauty is a thought. Beauty is the view. Beauty is your soul. Beauty comes from within. My dear followers, I hope you follow me and my work on Facebook and other social networks, so you have opportunity to meet my personality. Also, I hope you love the beauty of Serbia because it's really pure and wonderful. Personal Motto: What are your thoughts,that is your life!